Covering the Hockinson-Woodland game last week reminded me of something — the Hockinson-Woodland game of 2017. A year ago, it was Woodland that gave Hockinson its closest game in the regular season. Woodland led after the first quarter. It was a one-touchdown game at halftime. And while Hockinson would eventually pull away, the Beavers had one opportunity to make it a game again in the second half. “Dang it,” are two words Woodland coach Mike Woodward said to me three or four times during our brief post-game interview. He was so proud of the effort. The Hawks are No. 1 in the state for a reason. They have now won 19 consecutive games after completing the 14-0 perfect campaign in 2017. “It’s just so frustrating because their offense is so difficult to stop,” Woodward said. No amount of video scouting can really prepare a team for Hockinson’s system. “It was worse in person,” Woodward said. Levi Crum is the real deal: Remember back in August when Levi Crum said he knew he had huge shoes to fill in replacing Canon Racanelli as quarterback? 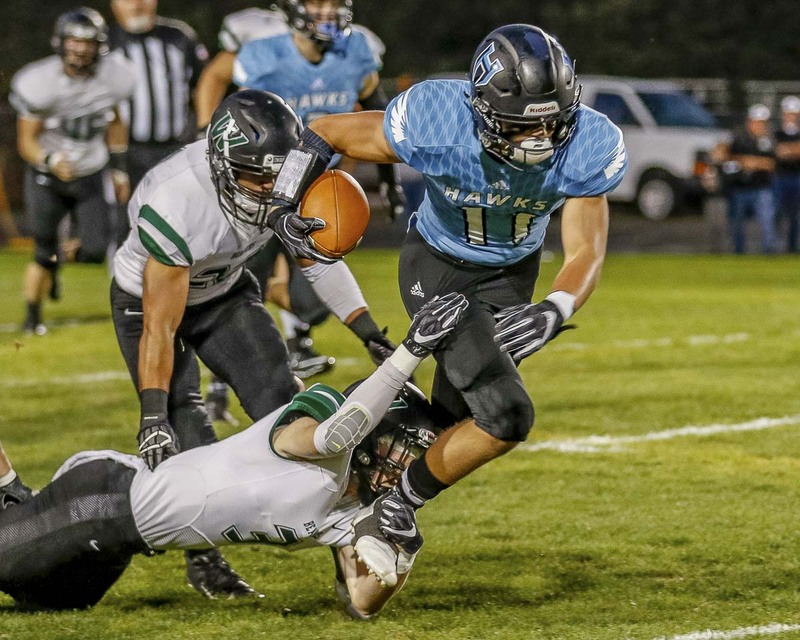 Hockinson Hawks, with new quarterback Levi Crum, look to defend Class 2A state football championship. He told us that it was not his job to put up Racanelli’s senior numbers in Crum’s first season as the starter. Crum said all he wanted to do was come close to Racanelli’s first season as a starter. It appears Crum is ahead of schedule. Back in Week 2, on the biggest stage of the regular season, in front of a TV audience and playing against a state power, Crum threw for 369 yards and five touchdowns, plus he rushed for 102 yards. 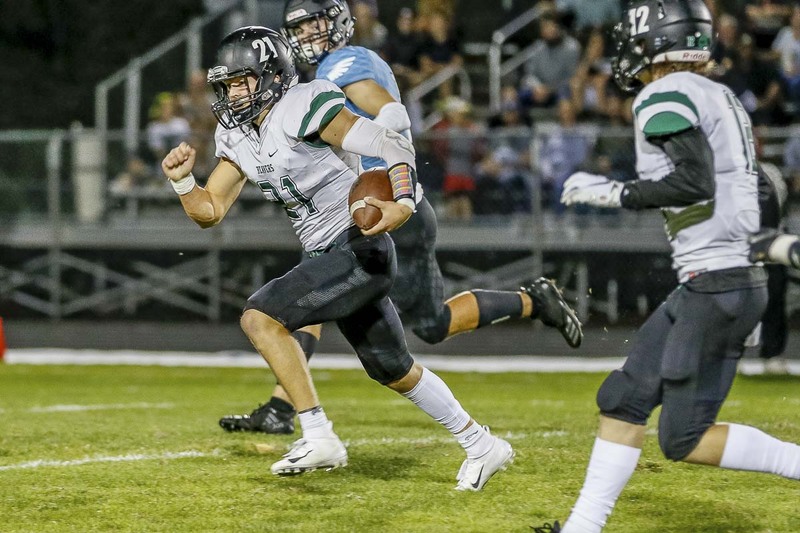 In the Woodland game, the biggest game of the 2A GSHL schedule to date, he threw for 330 yards and four touchdowns, plus he rushed for 130 yards and a score. Dynamic duo: One again, the Hawks had two receivers go for more than 100 yards. Sawyer Racanelli had eight catches for 141 yards and two scores, and Peyton Brammer had six catches for 106 yards and two TDs. Did he say double team? Brammer said it’s more than that. More than just the interception: Makaio Juarez had a big interception in the third quarter. Hockinson opened the second half with a touchdown on its first possession to take a 28-13 lead. Juarez then got a one-handed interception on Woodland’s first drive of the half. That led to another Hockinson touchdown and a 35-13 lead. That interception was fantastic, and it got a lot of attention. But I am not convinced it was the best play of the night by Juarez. Woodland had scored on its first two possessions of the game. The Beavers had hope. But after a bad snap, the Beavers found themselves second-and-long from their own 1-yard line. Instead of a safe run up the middle, the Beavers went for the big play. One-on-one coverage. A tall receiver vs. Juarez, who is listed at 5-6. An athlete has no control over his height. He does control his effort and technique. Juarez played perfect coverage on the deep pass, broke up the play, making it third-and-long for the Beavers. It was a 50-50 ball, and Juarez made the play. If it goes the other way, it’s a 40-yard gain, at minimum, or even a 99-yard touchdown for the Beavers. Juarez, in position the whole play, did his job. Flanagan fantastic again: The incredible season for Tyler Flanagan continued for the Woodland Beavers. He had a 12-yard touchdown run to give Woodland the early lead. He broke free for a 65-yard touchdown run on the final play of the first quarter for a 13-7 lead. He threw two touchdown passes to Kenyon Guy in the second half. Flanagan finished with 188 yards rushing and 160 yards passing. One of my favorite moments from this game was when Crum was scrambling for yards against the Woodland defense. Crum headed out of bounds, and Flanagan was making sure he got there. It could have been a big collision. Instead, Flanagan noticed Crum was indeed going out of bounds, then made sure he did not deliver a huge shot. The two quarterbacks appeared to say some nice things to each other and each patted the other on the back. Biggest 2A GSHL game of the year, these two were both putting on a show, AND they displayed the kind of sportsmanship we all should applaud. Well done. The Streak: Have to go back to November of 2016 for the last time the Hawks lost a football game. It is now 19 in a row. On the scoreboard, it was not a “convincing” win. On the field it was, though. At least for the Columbia River Chieftains. Mark Morris had a great game plan, slowed the game with clock management and a running attack, but the Chieftains adjusted and made all the stops they would need in order to win the game and remain in second place in the 2A Greater St. Helens League. The Chieftains executed on offense, too, for the most part. They ended up with 350 yards. Swain described it as a “crazy” night because Columbia River only had six possessions in the game. Yes, six. Both teams with long, long drives. Not a lot of scoring, but long drives. “Our offense really improved this week,” Swain said. “We’ve been putting in a lot of time to clean up things. It’s didn’t transfer to the scoreboard, but we were moving the ball. The Chieftains got the ball, up one, with about six minutes left in the game. They never gave the ball back to the Monarchs. That was impressive. That is a credit to the offensive line, too. Swain gave shout-outs to his left tackle, Elijah Hairston, and left guard, Elijah Stroup. The next test for the Chieftains will be Friday against Washougal. He added that the Chieftains are going to have to play better this week than last week if they are going to beat the Panthers. The improved Ridgefield Panthers gave the Panthers a tough one last week, but Washougal prevailed to pick up a league win. Next on the schedule is Columbia River. A year ago, Washougal, Columbia River, and Woodland all lost to Hockinson and then took turns defeating the other, forcing a three-way tie for second place. This year, Washougal has yet to play Hockinson but has already lost to Woodland. So for any shot at second place this season, the Panthers will need a win Friday. Washougal coach Dave Hajek said is trying to downplay the significance of this one game, though. He acknowledged, though, that the team that does lose will need some help along the way. So for right here, right now, it is the biggest game of the season for the Panthers. Good timing, too, because the Panthers learned a valuable lesson last week. Ridgefield exposed some weaknesses, Hajek acknowledged. The Panthers have been working on those this week. Still, the Panthers never lost the lead in the second half against Ridgefield. They got a fourth-quarter touchdown to go up by nine points and on Ridgefield’s next possession, Preston Thornton intercepted a pass and brought it back to the house to pretty much seal the deal. “Preston was in the right place at the right time and was able to take advantage,” Hajek said. Thornton, in fact, had two interceptions Friday, plus several tackles. On offense, as a wide receiver, he had several open-field blocks that led to more yards for his teammates. On special teams, normally the punter, he also had to do kicking duties. He made five extra points. Oh, and he did all this with a bad hamstring. “He had to play, and he came through for us,” Hajek said. Brevan Bea had another monster game with 15 tackles for the Washougal defense. OK, so it is now three losses in a row for Ridgefield. But make no mistake, this is such a better team than a year ago. My guess is it is a better experience for the players, as well. Ridgefield was right there, all night, with a team that made the playoffs a year ago. Washougal scored, then Ridgefield answered right before the half. In the second half, Washougal scored again, but Ridgefield came right back to make it a two-point game. Washougal would get another score, then a defensive touchdown, but this was a battle. Saw a couple highlights on HUDL. Loved how Ridgefield responded after falling behind 14-7 late in the first half. Hunter Abrams threw into traffic and I believe it was Jimmy Wallace who jumped high and came down with a 25-yard reception. On the next play, it was a 37-yard touchdown pass from Abrams to Wallace. In the third quarter, Washougal scored first and then got the ball two more times with a chance to go up by two touchdowns. Instead, the Ridgefield defense got the job done. Brock Harrison had a fourth-down tackle to end one drive. Then, it looked to me that Malachi Lee sacked the quarterback and stripped the ball at the same time for a sack, forced fumble, and recovery trifecta. That led to a long Ridgefield drive and a touchdown on the first play of the fourth quarter, keeping Ridgefield in the game.